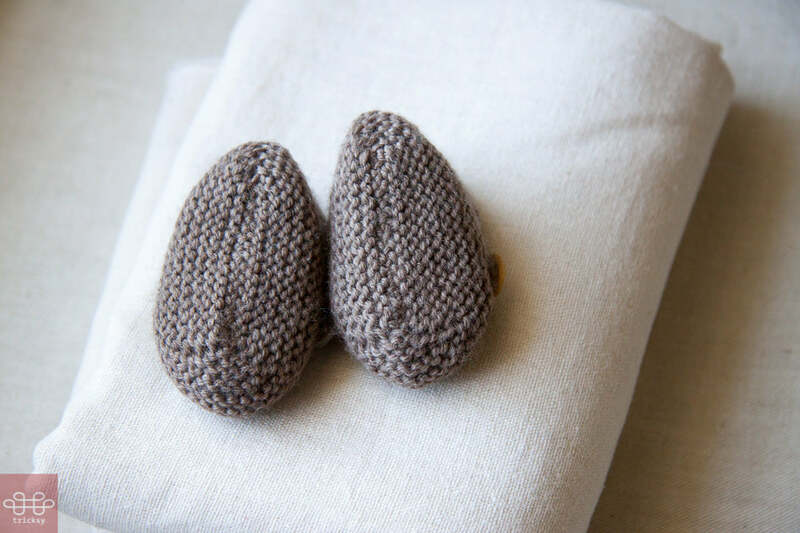 Saartje's Bootees by Saartje de Bruijn is a free pattern, downloadable on Ravelry, with instructions for two sizes. I would call the sizes Newborn and 3 months, but babies vary a lot, so use your judgment. (My babies were very large and skipped the newborn size altogether.) 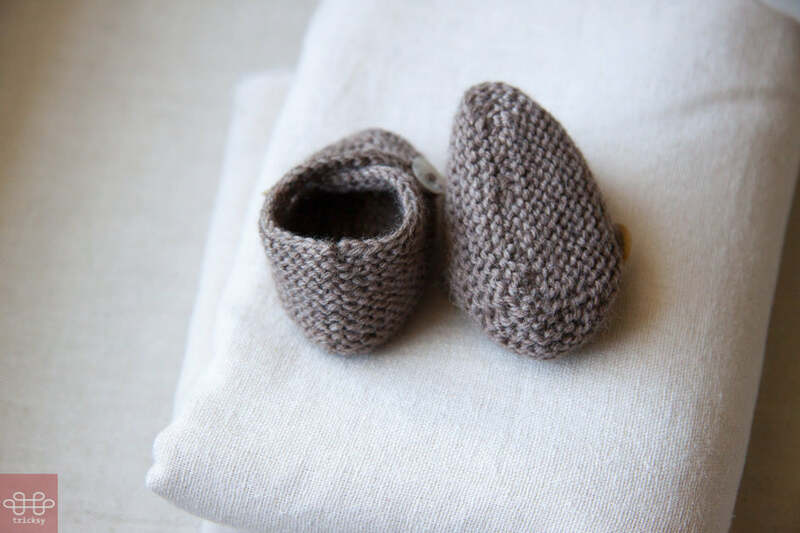 I made these in the smallest size, in Knit Picks Stroll, on 2.5 mm needles, and they fit a 8(ish) pound baby perfectly. I was in a hurry, so did not bother to do a gauge swatch. I did skim through other knitters' experiences on Ravelry, and decided 2.5mm would work well. 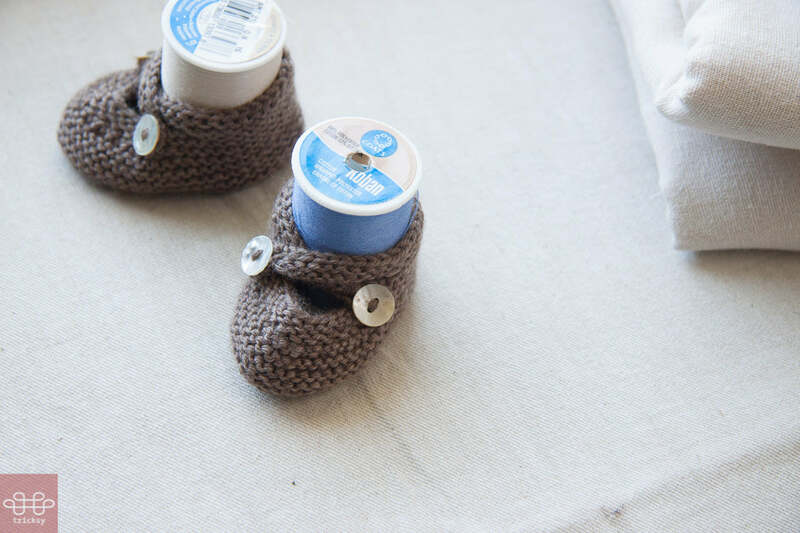 You can see the bootees on the actual baby feet here. Each boot is worked in garter stitch in one piece from the bottom up, starting at the center sole. The toe is shaped over a few rows, then the front opening is bound off. Then you cast on straps, work 2 more rows, and you're done! 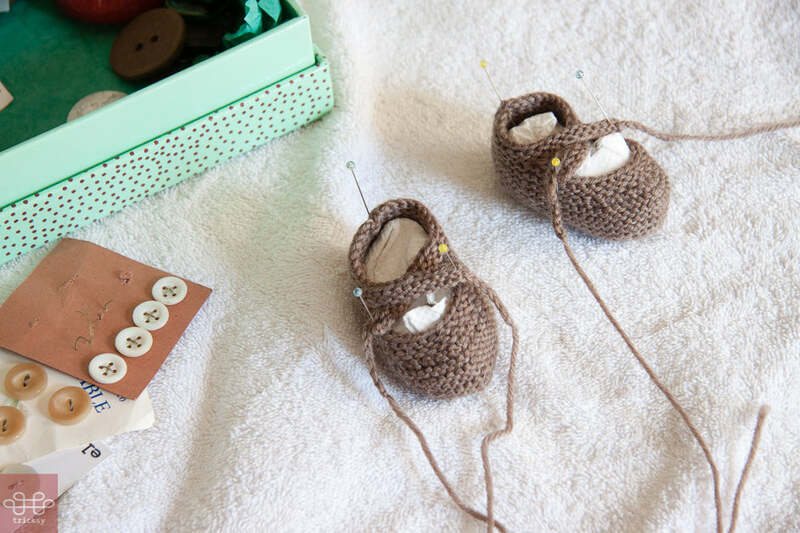 They knit up quickly, but do require finishing, so allow time for seams, blocking, weaving in ends, making button loops, and sewing on 4 buttons. In the pattern, where it says knit to marker, slip marker is implied but not stated. It's obvious once you get going, but I got caught out a couple of times. You could reduce the number of ends by using a different cast on for the straps. I used the one in the pattern, a long-tail, but of course this creates some more yarn ends. There are variations on Ravelry for making these in the round. This would mean less finishing, but I personally like the seams for the structure. Here are variations on Saartje's Bootees on Ravelry. One more note: on a newborn, these probably won't stay on. Newborn feet are like small wiggly potatoes, nothing stays on. Here are the seamed booties. I wet blocked them and let them dry flat overnight. In the morning, they were still moist. I shaped them with wads of paper towel stuffed in each boot and let them dry. The bootees got a little dishevelled with all the handling, so I put some spools of thread in them, buttoned them up, and spritzed them with water and let them dry again. The sole seam. I whipstitched the bottom shut from the wrong side, catching half a stitch of the cast on with the needle. The whipstitch seam isn't quite invisible, but has no bulk, so nothing to rub tiny feet. The heel seam. Don't use a full mattress stitch for seaming garter stitch. You can make an invisible, totally flat seam, by catching the garter bump at each edge, sewing from the right side. Knitty has a nice demo of this technique. Here's how they look from the side.